This is Hugo Eckener's home town in Germany. The city's history exhibit features 49 photos of Eckener and related items. It's in German but well worth a visit. Click "Bildserie" on the left menu to get to the photo page. Stop on by and see who's online discussing LTA! You'll need a Java capable browser. 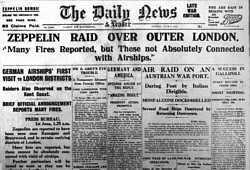 British newspaper announces the first Zeppelin raid on London, 31-May-1915. While the Germans had the capability to bomb Britain using Zeppelins from the start of the war, the Kaiser had banned this since he considered Britain as another "Christian nation" and viewed the bombing of civilians as less than gentlemanly. Under constant pressure from his military staff, he finally gave in and permitted a raid on the docks of the lower Thames, outside of London. On 19-Jan-1915, three German navy Zeppelins headed for Britain. The L 6 suffered a mechanical malfunction and returned to base. The L 3 and L 4 made it to their general target area but managed to inflict little military damage. Both returned to base undamaged. 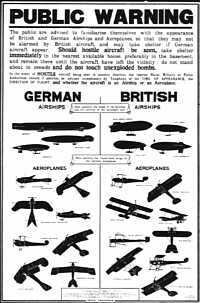 Poster displaying the outlines of various airships and airplanes - both friendly and enemy. The most successful raid was one made on London by the Zeppelin L 13, under command of 32 year old airship ace, Lieutenant Heinrich Mathy (featured in the Schwormstadt painting in the Fractal Gallery). 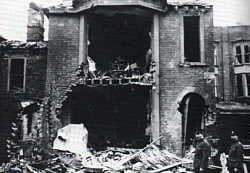 The raid took place on 8-Sep-1915 and killed 22 people and caused one half million pounds of property damage. This one raid would eventually account for nearly two thirds of all Zeppelin damage inflicted on Britain during the airship campaign. Lieutenant Mathy was killed during a raid on London 1-Oct-1916 when his L 31 was brought down by a British fighter. Zeppelin crew members posing with their aerial bombs. 1915 was a good year for the German Zeppelins. Not a single raider was lost to enemy fire. Several were lost due to mishaps and the highly explosive nature of the hydrogen that kept them aloft. The rigid airship's ability to come in at high-altitudes, 10,000 feet, kept them safely out of range of enemy fighters and ground based artillery. Zeppelin L 13 takes to the air. By 1916, innovations in design had increased the speed of rigids to 56 mph.Not all rigids were produced by the Zeppelin company. The Schutte-Lanz factory also produced airships for military use. Design innovations by the Schutte-Lanz works were responsible for the general appearance of rigid airships by 1915 (the sleek profile with the intregal rudder and tail fin). 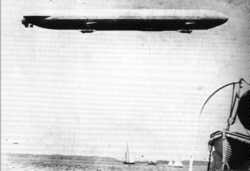 Zeppelin Z I during trials over the North Sea. Ernst Lehmann, who would later command the ill-fated Hindenburg, commanded several airships during the Great War - the Z XII in the Polish theatre and, later, the LZ 98 which participated in the largest Zeppelin raid on London on 2-Sep-1916. Sixteen airships of both the army and navy set off to attack London. Of these, only thirteen would reach their targets. The raid was less than successful with the Schutte-Lanz SL 11 being lost to enemy fire. Monsters of the purple twilight. 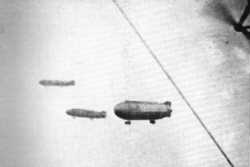 Zeppelins L 13, L 12, and L 10 on a bombing mission. 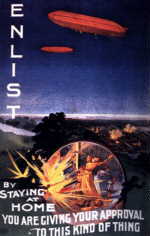 The British countered the threat of Zeppelins with the invention of incendiary bullets which were meant to ignite the hydrogen bags inside the hull of the airship. The Germans countered this with a new type of airship known as a height-climber. These stripped down rigids were capable of reaching altitudes in excess of 20,000 feet. The extreme cold and need for bottled oxygen at this altitude made conditions miserable for their crews. Parachutes were considered excess weight and, therefore, not carried. This was unfortunate since the lightened frame was exposed to more severe atmospheric conditions and caused the breakup of several ships. The view from the control gondola during a bombing mission over London. Zeppelin bomb damage at Yarmouth, England, 1915. The largest, single disaster came as an accident as opposed to enemy action. On 5-Jan-1918, a fire destroyed five Zeppelins and four hangars at the airship base at Ahlhorn. This dealt a deathblow to the German airship program. Searchlights illuminate a Zeppelin over London on 13-Oct-1915. The skeletal remains of downed L 33 at Essex, England in September of 1916. All in all, the German Naval Airship Service made a total of 159 sorties over Britain killing 557 people and inflicting $7,500,000 in property damage. In the end, it hardly seemed worth the effort. 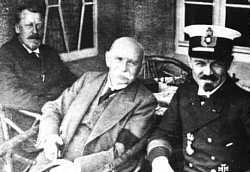 The Zeppelin men: (from left) Hugo Eckener, Count von Zeppelin, and Peter Strasser. Count Ferdinand von Zeppelin died of pneumonia on 8-Mar-1917 at the age of seventy-eight. Peter Strasser, Chief of the Naval Airship Division and the driving force behind the German airship program, was aboard the height-climber L 70 when it was shot down over the English Channel on 5-Aug-1918. This event marked the end of the airship as a strategic bomber. Hugo Eckener would go on to lead Germany's postwar airship program.